Context - In coming years, the world’s energy consumption is expected to increase dramatically. While fossil fuels will remain an important source of energy, renewable energies will also gain importance, as a result of concerns over high fossil fuel prices, increasing greenhouse gas emissions and energy import dependence. Could biofuels derived from forestry products and residues help meet the energy demand? While the global demand for energy is soaring, the sources from which energy is derived are changing. This change is induced primarily by concerns over high fossil fuel prices, greenhouse gas emissions and fossil fuel import dependence. Alternative forms of energy have gained popularity as a way to address these concerns. For instance, bioenergy derived from biological materials such as wood, agricultural crops and wastes, or dung is used. 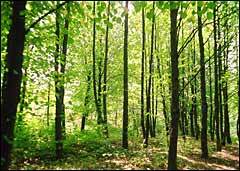 If sustainably managed, bioenergy derived from plants can be considered renewable because new trees or other plants can replace those that have been converted to energy. Its net benefit in terms of climate change mitigation depends on the balance between carbon dioxyde (CO2) captured during plant growth and CO2 released when producing, processing, transporting and burning the fuel. 3.1 Burning solid woodfuel in an open fire only converts about 5% of the wood’s potential energy, but technologies exist that can increase efficiency up to 80%. Such efficiency is achieved by combined heat and power systems, which use wood to produce both heat and electricity, and by some modern furnaces that burn wood pellets made of dried, ground and pressed wood residues. 3.2 ‘First generation’ liquid biofuels include biodiesel and bioethanol and are derived from various food crops that vary by geographical location, for instance cereals, rapeseed and sugar cane. These biofuels have attracted a lot of attention because of their relatively low prices and advanced state of development. However, the increasing use of certain food crops for biofuel production can in some cases significantly raise global greenhouse gas emissions as a result of deforestation and land degradation. Recently, new plant species have been tested that grow well on marginal lands and could therefore produce biofuels without directly competing with valuable lands. To counteract the potentially adverse socio-economic and environmental impacts of large bioenergy projects, effective land-use planning is needed. In addition, information transfer from developed to developing countries should be encouraged. prevent the destruction of natural resources and the loss of biodiversity. In coming years, the world’s energy consumption is expected to increase dramatically, particularly in Asia. While fossil fuels will account for most of the increased energy supply, renewable sources of energy will also gain importance, as a result of concerns over high fossil fuel prices, increasing greenhouse gas emissions and energy import dependence. Bioenergy, including energy derived from wood and other plant materials, accounts for a significant proportion of the current energy supply from renewable sources. In many of the world’s developing countries, fuelwood and charcoal (traditional bioenergy) remain the primary source of energy. In industrialized countries and particularly countries with large wood processing industries, wood energy is used for both domestic and industrial purposes. Currently most liquid biofuels are produced from food crops and yield low economic and environmental benefits compared to fossil fuels. The increased use of these crops for energy production may even compete with food supply and lead to increased deforestation. However, it is expected that a new generation of liquid biofuels will become available in the next decade using wood as well as agricultural and forestry residues. This technology is expected to become commercially competitive and generate much less greenhouse gases compared to fossil fuels. Such second-generation liquid biofuels produced from woody biomass rather than from food crops would also reduce competition with food production. Wood-based energy is among the most efficient sources of bioenergy. At present, it is particularly competitive when using wood residues from the wood processing industry. To avoid negative environmental and socioeconomic impacts, the expansion of biofuel production will need to be accompanied by clear and well enforced regulations.